What are the real marijuana risks for teens? 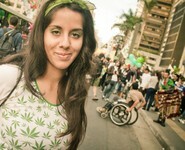 Regular moderate marijuana use won’t do an adult much harm, but it will harm a teenager. Brain development continues through adolescence. If you smoke marijuana regularly during certain key periods of adolescence, you pay a lifetime price. Parents – get your son or daughter to just delay marijuana use to the age of 21 and save them from a host of permanent cognitive impairments. What do the experts suggest? Learn about the ideal values that drive effective adolescent treatment (teens aren’t just mini-adults) and learn the essential questions you need to ask to get the right care for your son or daughter. Imagine you promised to keep a teen friend's secret about cutting or or another form of self harm...should you really stay quiet? No, you shouldn't. Here's what you need to do and why. Children with ADHD face a variety of challenges when they first leave home. What can parents do if they start to see signs of substance abuse in their newly independent young adult children? OK – you’ve caught your son or daughter drinking or using drugs – now what? Well, the first thing you need to do is make sure they don’t repeat their mistakes and keep using or drinking, and if they can’t or won’t stop, then you need to get them some help. So after catching them experimenting with substance use, what’s really important is that you monitor their activities so that you’ll know right away if they continue to use or drink. Here are 5 ways to do just that.